Who should attend: Teachers, teaching assistants, play area staff, nursery staff, sports coaches, and anyone who is specific to infants aged 0 to 1, and children aged from 1 year old to the onset of puberty. Parents and Home Help can also benefit from our course. Pricing at cart is inclusive of VAT and an additional 5% will be automatically added for payments done through PayPal. Do you own or manage a child related business in the UAE? Your staff are in constant care of children of all ages, and with so much excitement accidents could happen. 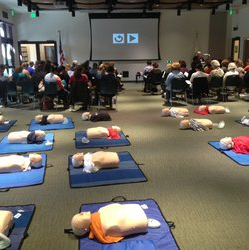 Congratulations for choosing to embark on training your team in first aid. You are the elite of childcare, nurseries, kindergartens, schools, play areas, sports centers, and are showing a true care for the children. At the end of the course, you will be able to display your certificates in your lobby for parents to see , and we will even give you a logo to place on your website to show that you are a responsible educator. We offer the Highfield's Paediatric course as the perfect solution to your first aid needs, please see below for a course description and more details on how to make your play area safe and child friendly. We are a fully accredited training center, with fully qualified nurse trainers. Please visit our accreditations page for full details of our licenses and permits. Furthermore, we have full insurance coverage for our premises, instructors and trainees during courses. Our courses are taught in an entertaining and educational video based manner. Courses can be held on your premises or our Training Center. For group bookings, please call +971 (0) 4 343 3799. Certificate of Completion will be available within 14 days post training date and can be collected at our office. We can issue you email of completion while you are waiting for your certificate. The Perfect Help trainers are all internationally accredited First Aid instructors and qualified nurses with hospital experience. All instructors have been approved by Dubai Corporation for Ambulance Services, the regulatory body for First Aid in Dubai. Our course is suitable for Teachers, Teaching Assistants, any nursery staff member, or anyone else who is in contact with infants, toddlers and children. Parents and Home Help are also welcome. How many staff should I send for training? This depends entirely on the size of your company, industry sector and how much you value the safety of your staff, customers and materials. If you are a general trading company we recommend you have at least 2 first aiders to always have one on duty. Please call us for more information on required numbers. Do you offer special rates for big groups? Yes, we do offer group rates, please call us on +971 4 343 3799 for more information. We can teach in your company venue, or at our training centre on Sheikh Zayed Road, near FGB Metro Station in Dubai.For a detailed location map and instructions, please visit the “Contact Us” section on the website. What is required to have a course at our company premises? We come to offices in all emirates to teach for groups and require at least 10 - 12 students per session. Do you teach at weekends? Yes, we teach 6 days a week (Saturday - Thursday) and can adapt our timings to suit your needs.